Found this on ebay and couldn't resist it. Dating from 1919, back in the days when toilet paper came in a wrapper. And as you might expect, there are folks who collect these things. 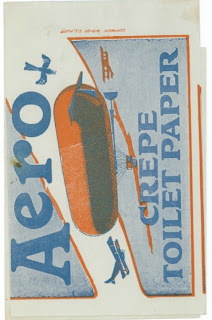 I'm still trying to figure out what they were thinking of in terms of the brand match between toilet paper and an airship. Suggestions anyone?